Since the 1970s, Liechtenstein has been using its low corporate tax to attract companies. Today, it is also considered an offshore financial centre by notable institutions such as the OECD and the IMF. The Financial Secrecy Index (managed by the Tax Justice Network) also designate Liechtenstein an offshore financial centre. At the time of writing, Liechtenstein has 17 chartered banks and a handful of licensed non-bank financial companies. There is also a wide range of public investment companies available, as well as insurance companies and re-insurance companies. Liechtenstein specialises in financial services for foreign entities, and offers a low tax rate, straight forward rules for incorporation and beneficial corporate governance legislation. There is also a comparatively strict banking secrecy, and the law permits corporations to issue bearer shares. Liechtenstein is one of few countries in the world where the number of registered companies outnumber the citizens. In 2009, Liechtenstein strengthened its regulatory oversight to counteract money laundering. Numbered bank accounts used to be legal but is no longer, due to new regulations that requires know-your-customer practices for all bank accounts. Liechtenstein has also agreed to exchange information with the British department HM Revenue & Customs. In May 2009, the OECD removed Liechtenstein from its blacklist of uncooperative countries. The government of Liechtenstein taxes personal income, business income and principal (wealth). The taxes are, however, quite low from a European perspective. The basic tax rate on wealth is 0.06 percent per year, and the combined total rate is 0.89 percent. The tax rate on corporate profits is 12.5 percent. The basic rate of governmental personal income tax is just 1.2 percent, but each of the communes that make up Liechtenstein impose their own income tax in addition to the governmental income tax. The combined personal income tax rate is therefore almost 18 percent. Also, an additional income tax of 4.3 percent is levied on employees to pay for Liechtenstein ‘s social security program. For self-employed, this tax is higher, up to a maximum of 11 percent. The rate of gift tax and estate tax depends on the relationship between the involved parties. It stays within the 0.5% – 0.75% span for spouses and children, but is considerably higher in other instances. With non-related parties, the recipient can be required to pay up to 18% gift tax. The estate tax is progressive and can reach 27% for a non-related recipient. 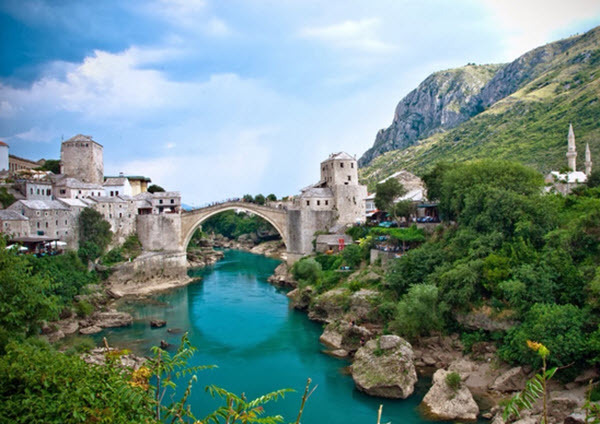 Liechtenstein is no longer on any blacklists of uncooperative tax havens. 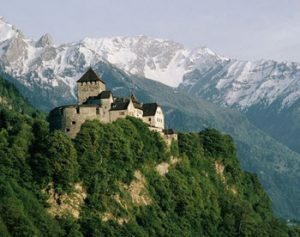 Liechtenstein is a popular choice among high net worth individuals and businesses that wish to place money in foundations. Stiftungen (foundations) can be registered in the name of a Lichtensteiner (typically a lawyer) instead of using he real owner’s name. Liechtenstein is also the home of many philanthropic and charitable foundations. Examples of foundations established in Liechtenstein are The Rothschild-Crutchfield Foundation, The Alexander S. Onassis Foundation, The Prince of Liechtenstein Foundation, The European Centre of Austrian Economics Foundation, The Marcala Foundation, and The Thesaurus Islamicus Foundation. After World War II, the economy of Liechtenstein was in a really bad shape and the ruling Liechtenstein family survived by selling family heirlooms. By the late 1970s, the economy had become very strong, largely thanks to the low corporate tax rates that made Liechtenstein an attractive seat of incorporation. Today, Liechtenstein ‘s population enjoys one of the world’s highest standards of living and the Prince of Liechtenstein is one of the world’s wealthiest monarchs. The financial sector centred in Vaduz is extremely important for Liechtenstein ‘s economy, as is tourism. Liechtenstein also has a manufacturing industry, where goods such as electronics, textiles, precision instruments, power tools, and pharmaceuticals are produced. Within this industry, Hilti is the largest employer, making direct fastening systems and other high-end power tools. Switzerland is an important trading partner for Liechtenstein , and Liechtenstein participates in a customs union with Switzerland and has adopted the Swiss franc as its official currency. Liechtenstein is not a member of the European Union, but has been a member of the European Economic Area (EEA) since 1995. Liechtenstein has also been a full member of the European Free Trade Association (EFTA) since 1991. (Prior to 1991, it was in EFTA as part of Switzerland). Liechtenstein is heavily dependent on other nations for its energy use; it imports approximately 85% of its energy. The Principality of Liechtenstein (German: Fürstentum Liechtenstein) is a landlocked nation in Central Europe, bordered by Switzerland and Austria. It is a constitutional monarchy with the rank of principality, headed by the Prince of Liechtenstein. With an area of just over 160 square kilometres, Liechtenstein is one of the smallest countries in Europe, and it is also one of the least populated. In 2014, it’s estimated population was slightly above 37,000 people. A third of the population is foreign-born, and foreign-born people make up two-thirds of the country’s workforce. Many of the foreign-born residents come from Germany, Austria or Switzerland and have some dialect of German as their native language. The Liechtenstein dialect of German is quite different from the Standard German of Germany, and more similar to Swiss-German and the dialect spoken in Vorarlberg (in Austria). The oldest evidence of humans being present in Liechtenstein is from the Middle Palaeolithic era.